HomeHow to choose between a Ferrari or Ferretti 550? How to choose between a Ferrari or Ferretti 550? The 2014 edition of the Cannes Yachting Festival, which marked the beginning of the new international nautical season, was the perfect stage to announce the next, enthralling chapter of a 45-year business history. 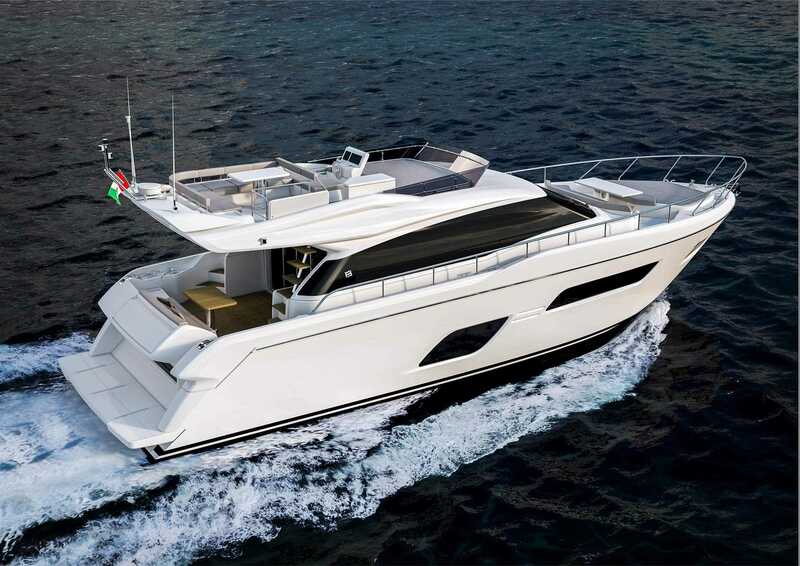 It was there, indeed, that Ferretti Yachts presented the project of the Ferretti Yachts 550, a very important boat that will help the brand and the Ferretti Group as a whole to achieve the growth objectives they are currently pursuing. The birth of the new entry-level -in the Ferretti Yachts family, whose first hull will be launched next Spring, will be the first step of a long-term strategic process that will involve the brand’s entire range. 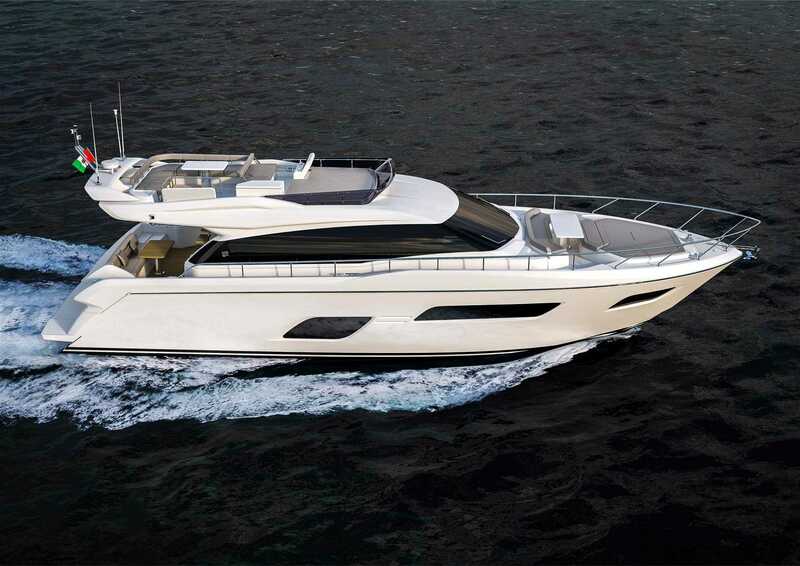 Ferretti Yachts can presently boast a fleet of eight flybridge yachts between 55 feet (the length of this new project) and 96 feet (that of the Ferretti Yachts 960, the brand’s flagship). In the near future this fleet is bound to grow even more, so as to ensure an increasingly diversified offer, also in the segment below 50 feet in length. “During Cannes Yachting Festival we introduced our global sales network and the Press to our forthcoming ambitious plans for this brand”, explains Stefano De Vivo, Ferretti Group’s Chief Commercial Officer. 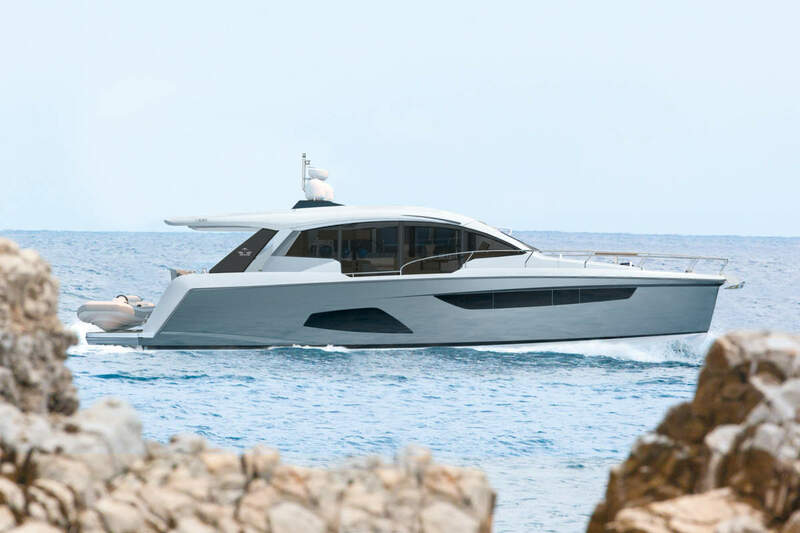 “And this new craft is part of a strategy aimed at attracting the interest of many new owners all over the world, for whom this new 55-footer and the forthcoming Ferretti Yachts boats will be a response to their wish to enjoy the sea as never before”. 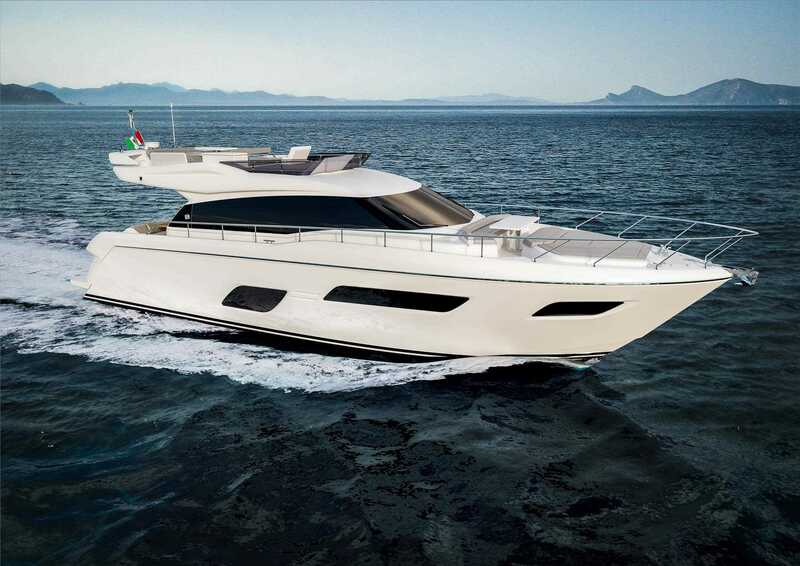 The Ferretti Yachts 550 is the result of the cooperation between AYT&D, the Group’s research, development and style department, and Studio Zuccon International Project. It is characterised by a brand-new hull, and equally brand-new are the layout of the engine room and that of the main deck, as well as the interior arrangement. In addition to this, special care has been devoted not only to guaranteeing maximum production efficiency and effectiveness, but also to optimising the yacht’s weight balance, thereby ensuring great performances even if small, light and low-consumption engines are installed. The profile of the boat is characterised by sober, streamlined, slender lines, blending together refined elegance and a sporty character. The uninterrupted glazing running across the main deck further enhances the boat’s rakish profile, and is complemented by a large, aerodynamic flybridge. 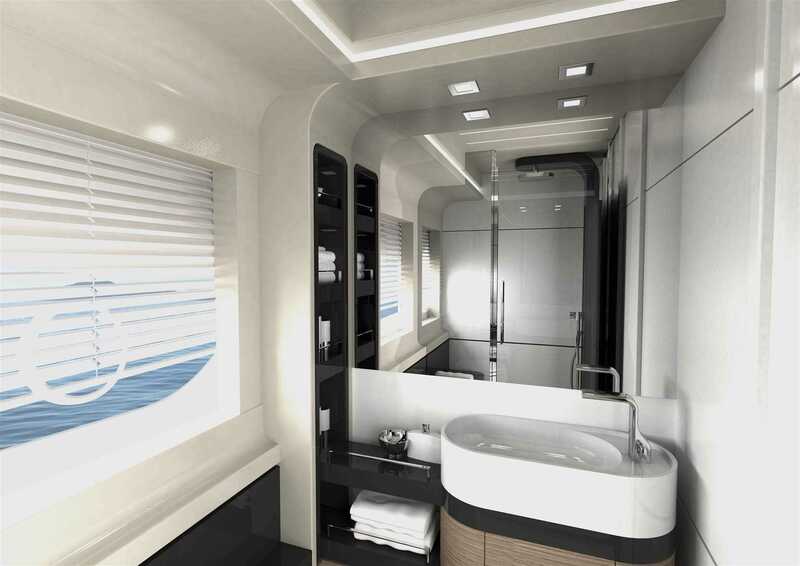 Three large glazed surfaces – the cabins windows – can be found on both sides of the hull. Each has flush frameless fibreglass portholes resulting in very clean lines. 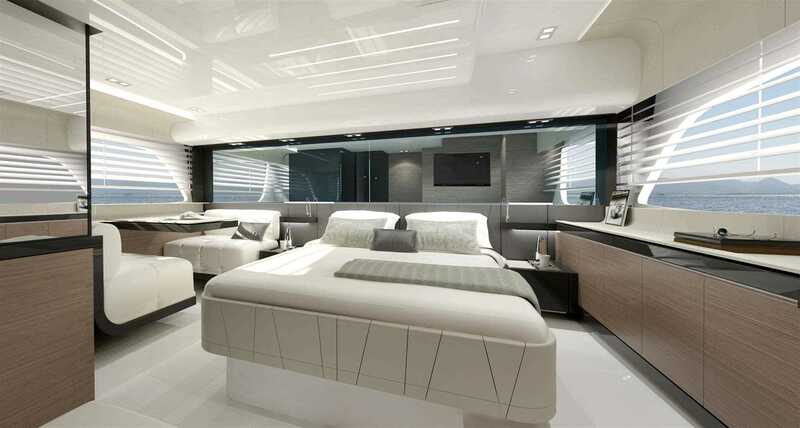 This yacht’s interior spaces and onboard equipment allows it to be on an equal standing with much larger yachts. 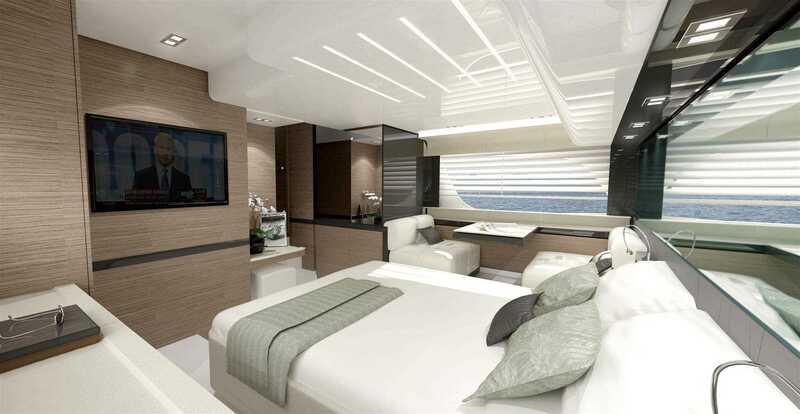 Many outdoor relaxation areas have been conceived: the forward dinette area, furnished with facing sofas and a table; the large sunpad on the deckhouse; and the cockpit, featuring a large aft sofa and a table. On the flybridge, the storage cabinet and the restyled, small-size pilot station instrument panel allow to extend the relaxation areas – both the sunpad and the comfortable dining area – even more. The Group’s Centro Stile has found very appealing décor solutions, adding elegance to all onboard ambiances and preserving the range’s unique Made-in-Italy style and charm. The cockpit and the aft area of the salon stand out for an impressive décor consistency. Indeed, the teak flooring found in the cockpit continues indoor, in the galley and the entrance, visually and ‘physically’ harmonising these different environments. This flawless continuity is also ensured by the new three-section glazed door that can be folded to starboard and concealed behind the stairs leading to the flybridge. The perfect harmony between form and content, aesthetics and functionality is completed by the ceiling panel decoration, which is the same in the salon and outdoor, creating as a sort of ‘style mirror’ that welcomes all guests at best. The cockpit thus becomes an extension of the interiors, which can be opened completely onto the sea on all sides. Access on-board is from the aft swimming platform via several steps obtained in the hull on the starboard side, to which an electrical-hydraulic gangway leading directly to the cockpit may also be added. Left of the sofa is an accessway to a large below-deck storage area which, upon request, can be converted into a sailor’s cabin. The swimming platform can also be fitted with a tender lift with slide that can be lowered or lifted by over one meter, allowing a tender up to 3.25 metres long to be comfortably and safely launched and hauled. When the tender lift is operated it also ‘reveals’ some steps in the hull that make it possible to go into and come out of the water extremely easily. This area also features a low cabinet below the staircase leading to the flybridge, where the icemaker can be installed. The large glazing cutting across the deck lets plenty of natural light into the indoor salon, which includes an open galley with a peninsula and a refrigerator unit, cabinets for the glassware and audio/video systems, as well as a slightly raised living area furnished with a dining table and chairs to starboard and two more facing sofas to port, separated by the TV unit. Beyond this area, to port, the pilot station can be found. The areas below deck come in as many as three alternative layouts. The two ‘traditional’ ones include three cabins – the master stateroom, the VIP cabin, and the guest cabin – with two or three bathrooms. This wide range of solutions can attract different types of owners, who will be able to choose from among the different layouts depending on the way they intend to use their yacht. The full-beam master stateroom is completed by a dinette furnished with a table and two facing seats, a walk-in wardrobe and a vanity set/desk with a pouf. The bathroom is raised with respect to the double cabin and is fitted with a second full glazing that ensures great brightness even in the shower box, which is separated from the rest of the room by a glass wall. 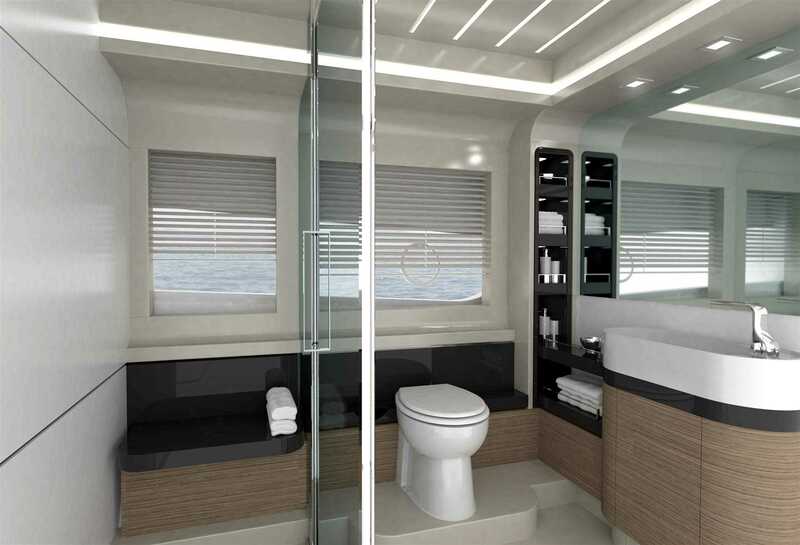 The VIP cabin is located at the extreme bow and features a double walk-in wardrobe and a vanity set with a pouf, which in the layout with three heads can be replaced by a private bathroom. As usual, the by-now well-known ‘Tai He Ban by Ferretti’ special edition is also available, targeted in particular at the owners from the Asia Pacific region. In this version, some cabins can be replaced by areas devoted to business meetings or social events, and the galley can be moved below deck, thereby further extending the relaxation areas on the main deck. Available both in the open version (with a large Bimini top sheltering the dining area) and with a streamlined hard top covering the entire deck, the flybridge is dominated by a large C-shaped sofa surrounding the table, which can be extended and moved around. 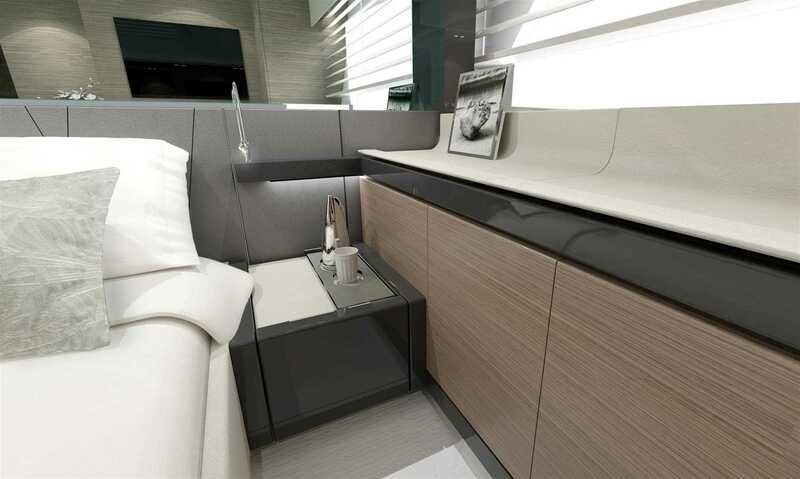 The backrest towards the pilot station can be tilted to convert the part of the sofa facing the cruising direction into a double seat for the captain and a co-pilot. The bar unit is located starboard. The new project will allow to install highly-performing engines that are however small-sized and have a limited power: two 715 mhp, 2,500 rev/minute shaft drive engines, that will push the yacht to a maximum speed of 30 knots and a cruising speed of 26.5 knots. The range will be 250 and 300 nautical miles (preliminary data), respectively. A bow thruster will be installed standard on the Ferretti Yachts 550, while a gyroscope stabilizing system can be installed upon request to ensure even more comfort at anchor and facilitate berthing manoeuvres.